Kohima, the capital city of Nagaland state, is some 200 kilometres from the Indo-Burmese border (now known as the Indo-Myanmar border). 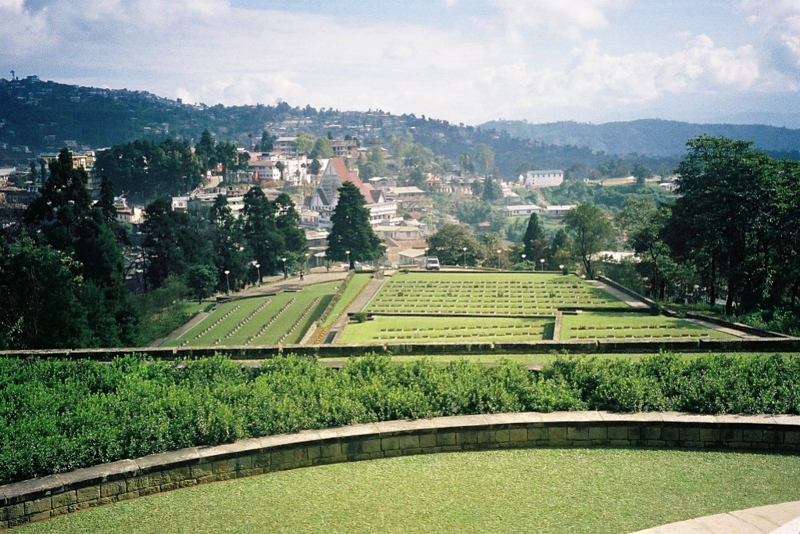 Kohima is best reached by air from Calcutta to Dimapur or from Delhi to Dimapur via Gauhati in Assam State and then by a winding road up the mountains. 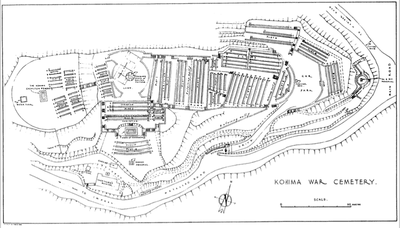 Kohima is 74 kilometres from Dimapur. It can also be reached by road from Gauhati - a long and difficult journey. 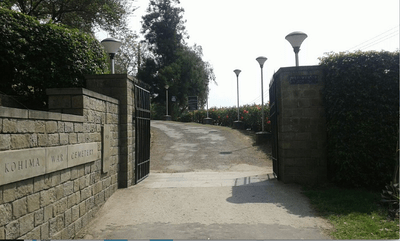 Kohima War Cemetery is situated on the left of the Imphal-Diampur road (Highway 39) close to the centre of the town. 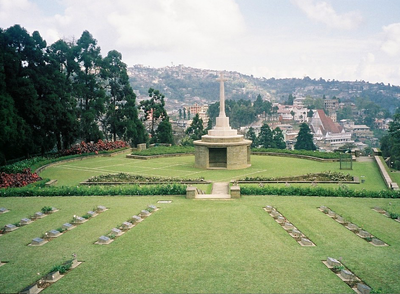 Kohima War Cemetery is open everyday 09:00-16:00. The cemetery is completely terraced with terrace levels ranging from 3 - 5 metres high which makes wheelchair access to this site impossible. 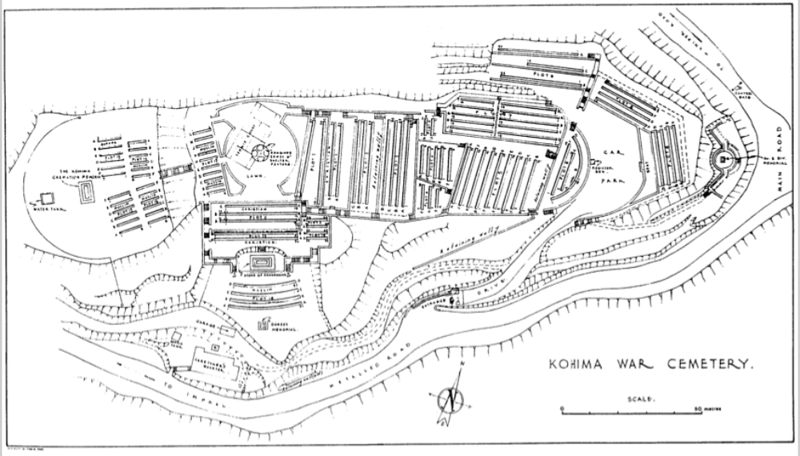 The Japanese advance into India was halted at Kohima in April 1944 and Garrison Hill, a long wooded spur on a high ridge west of the village, was the scene of perhaps the most bitter fighting of the whole Burma campaign when a small Commonwealth force held out against repeated attacks by a Japanese Division. 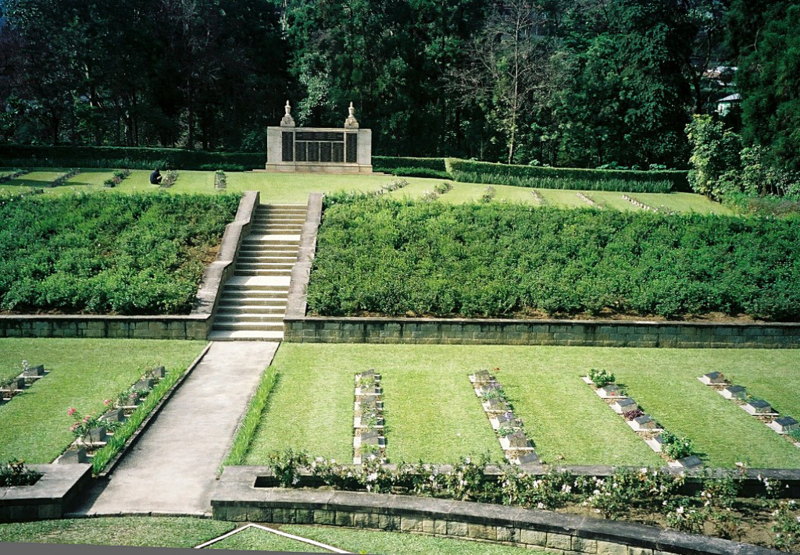 The fiercest hand to hand fighting took place in the garden of the Deputy Commissioner's bungalow, around the tennis court, but the heaviest casualties on both sides occurred after relieving forces reached the Garrison and the Japanese were driven off the ridge, so re-opening the road to Imphal. 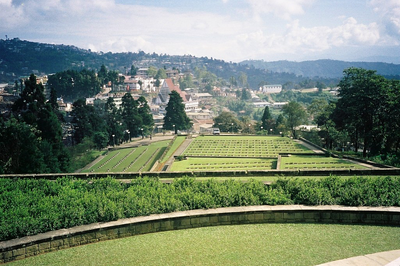 KOHIMA WAR CEMETERY lies on the battle ground of Garrison Hill. No trace remains of the bungalow, which was destroyed in the fighting, but white concrete lines mark and preserve permanently the historic tennis court. 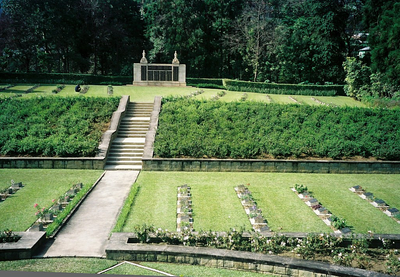 The cemetery now contains 1,420 Commonwealth burials of the Second World War and 1 non-war burial. 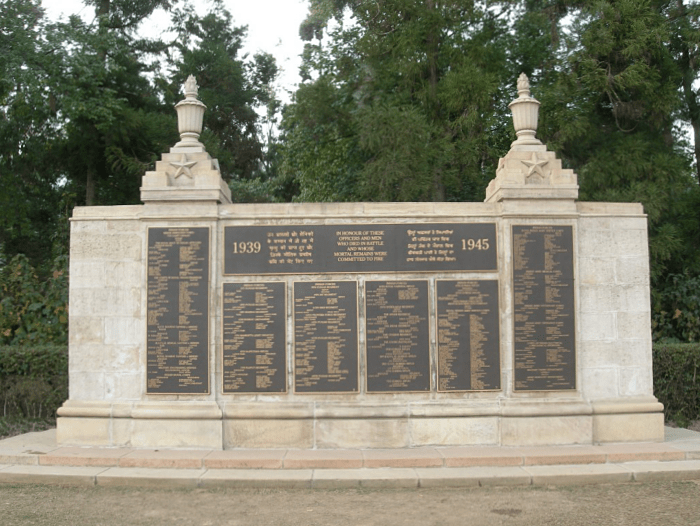 At the lower end of the cemetery, near the entrance, is a memorial to the 2nd Division. It bears the inscription;- "When you go home Tell them of us and say, For your tomorrow, We gave our today." 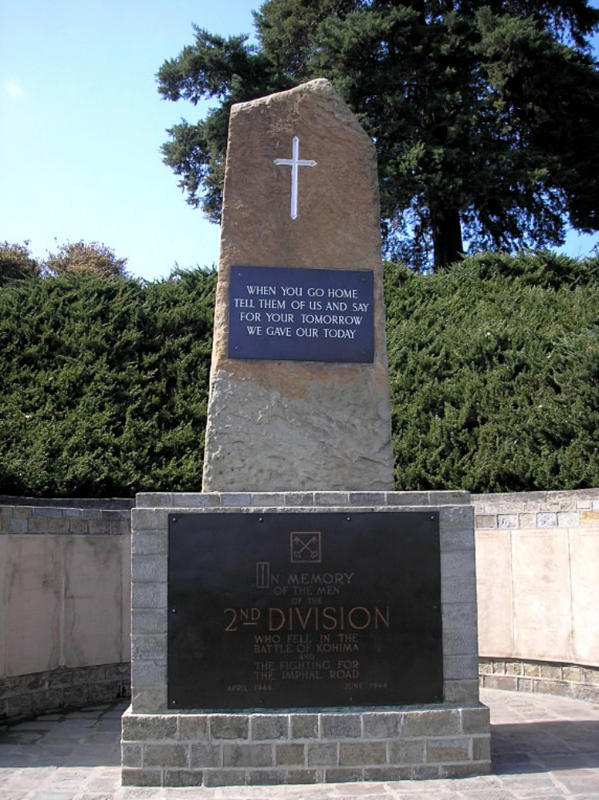 The cemetery also contains a memorial to the 2nd Battalion, the Dorsetshire Regiment and a number of other regimental memorials have been erected on and near Garrison Hill. The cemetery was designed by Colin St. Claire Oakes. 295822 Lance Corporal John Pennington Harman, V. C.
4th Bn. Queen's Own Royal West Kent Regiment, died 9th April 1944, aged 29. Plot 8. E. 3. Son of Martin Coles Harman and Amy Ruth Harman, of City of London. Citation: The following details are given in the London Gazette of June 20th, 1944:- At Kohima, Assam, on 8th April 1944, Lance Corporal Harman was commanding a section of a forward platoon. The enemy had established a machine-gun post within 50 yards of his position which became a serious menace to the remainder of his company. Unable to bring the fire of his section on to the post, Lance Corporal Harman went forward by himself and annihilated the post, returning with the enemy machine-gun. The next morning, having first recovered a forward position, he again charged an enemy post alone, shooting four and bayonetting one, thereby wiping out the post. As he returned Lance Corporal Harman received an burst of machine-gun fire in his side and died shortly after reaching our lines. 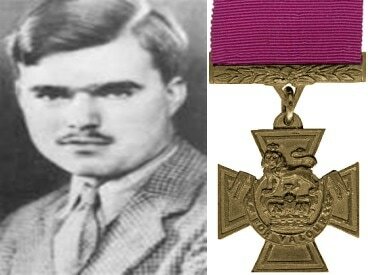 Lance Corporal Harman's heroic action and supreme devotion to duty were largely responsible for the decisive way in which all attacks were driven off by his company. 130097 Captain John Niel Randle, V. C.
2nd Bn. Royal Norfolk Regiment, died 6th May 1944, aged 26. Plot 2. C. 8. Son of Dr. Herbert Niel Randle and Edith Randle; husband of Mavis Ellen Randle, of Holywell, Oxford. Qualified in Final Honour School in Law for the degree of B.A. (Oxon). Citation: The following details are given in the London Gazette of December 8th, 1944:- On the 4th May, 1944, at Kohima in Assam, a battalion of the Norfolk Regiment attacked the Japanese. Captain Randle took over command of the company which was leading the attack. His handling of a difficult situation was masterly, and although wounded himself he continued to inspire his men until the company captured its objective. He then brought in all the wounded men who were lying outside the perimeter. 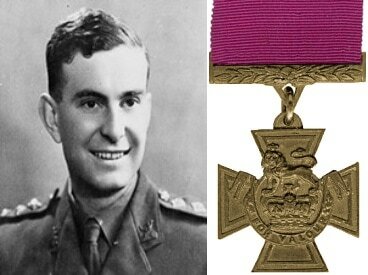 Captain Randle refused to be evacuated, and despite his wound carried out a personal reconnaissance with great daring, prior to a further attack on the new enemy positions. At dawn on 6th May Captain Randle led this attack, and ran into heavy fire from a bunker. Appreciating that the destruction of this enemy post was imperative, if the operation was to succeed, Captain Randle charged the Japanese post single-handed. Although now mortaly wounded, he silenced the gun with a grenade thrown through the bunker slit. He then flung his body across the slit so that the aperture should be completely sealed. The bravery shown by this officer could not have been surpassed, and by his self-sacrifice he saved the lives of many of his men and enabled not only his own company but the whole battalion to gain its objective and win a decisive victory over the enemy. At the highest point in the cemetery stands the KOHIMA CREMATION MEMORIAL commemorating 917 Hindu and Sikh soldiers whose remains were cremated in accordance with their faith.